How to find gravity normal by ECEF or GPS coordinate of point? Is it the same as normal to elipsoid? Is this ordinary way to calculate normal to ellipse? I'm not quite sure which altitude is GPS use, but it seems if it use geodetic latitude it already perpendicular to elipsoid. To compute normal(I want it in ECEF) I need 2 points, 1st point I get directly from GPS coordinate converting it to ECEF and 2nd point I need to compute. For example point that have Z=0. What I'm generally trying to do is to determine tilt from gravity normal of some tall object (like Leaning Tower of Pisa) having GPS positions of top point and ground point. 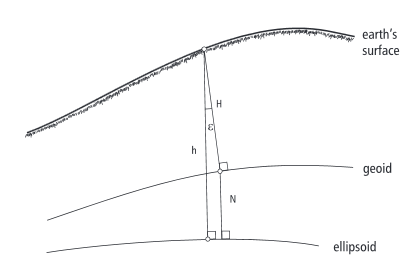 The normal to the ellipsoid is the vector orthogonal to the tangent to the ellipsoid at that point. This will not point to the center of the earth except at the equator and the poles. The gravity vector is orthogonal to the geiod and varies from the ellipsoidal normal by an amount called the deflection of the vertical. Which is usually expressed in the north-south and east-west amounts. This is what I believe you want to calculate. Look at NOAA NGS website they have a program with source for computing deflection of the vertical called "deflect". I realise this is an old thread now but for future reference Earth is represented as a type of ellipsoid called an oblate spheroid. The oblate spheroid is a result of the balancing between self gravitation forces and rotation forces (centrifugal force) and this balancing intuitively results in an force vector that is equal at all points along the spheroid and normal to this spheroid (not the geoid). Contrary to some comments on this post, the gravity vector WILL point directly towards the centre of mass of the oblate spheroid (not normal to the surface). It is the resultant force of the gravity vector and centrifugal force vector that causes the force that we experience to be normal to the surface of the Earth. This is called "Effective" or "Apparent" gravity. n-vectors are used in Geodesy (https://en.wikipedia.org/wiki/N-vector). 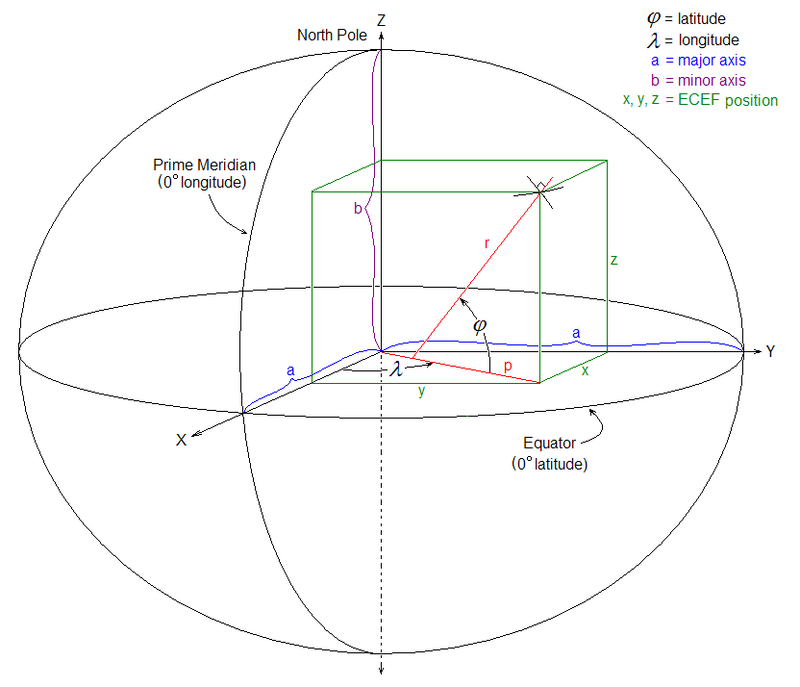 They provide (in some circumstances) and alternative and singularity free representation of a Geodetic lat,lon representation and are defined as unit vectors that are normal to the reference spheroid (this seems to be what the question is about). The wikipedia article given above is quite good. The distance between the surface and the intercept of n-vector with the ECEF Z-axis is the prime vertical radius of curvature (again, wikipedia gives a good explanation of this). Using this, you can encode a normal vector with a known magnitude that represents a unique position on the surface of an oblate spheroid. Not the answer you're looking for? Browse other questions tagged coordinate-system gps wgs84 geoid or ask your own question. How to find ring of coverage of GPS Satellite on WGS-84 ellipsoid? How to find a point on map with GPS coordinates? Converting ECI coordinate system to ECEF coordinate system? Finding GPS coordinates of point located between 2 known meridians? What GPS geographic coordinate system is this?